The W&M approved IT8000E is designed for demanding industrial applications in the chemical and pharmaceutical industry, in the food industry and in many other sectors of industry. 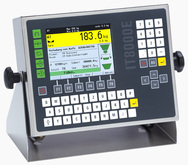 The industrial design with the powerful modular hardware and the concept of free programmability make the IT8000E the ideal weighing terminal for standard or application-specific solutions, eg for: Shipping and receiving Filling and batching systems Totalizing bulkweighers Checkweighers Vehicle / axle weighing Mobile data capture systems. The modular design provides for a variety of configurations and options, such as: Enclosures for wall-mount, desk-top or panel-mount installation or as blackbox DC or AC power supply Connection of scales with analog or digital force transducers 10/100 Mbps Ethernet interface with integrated web server WLAN as option Integrated USB 2.0 host interface for printer, scanner and USB stick Up to 4 serial interfaces, RS232, RS485, RS422, 20mA CL selectable Flexible I/O concept for up to 64 inputs and outputs Fieldbus interfaces Profibus DP or Modbus TCP Analog I/Os, etc. This ensures that the optimal system configuration can be chosen, for stationary as well as mobile use.